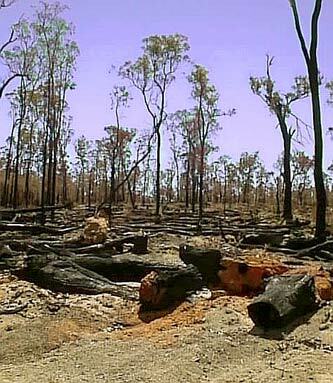 Warrup forest block contains the last remaining old-growth and high conservation value jarrah-marri forest outside conservation reserves in the south-eastern jarrah forest. 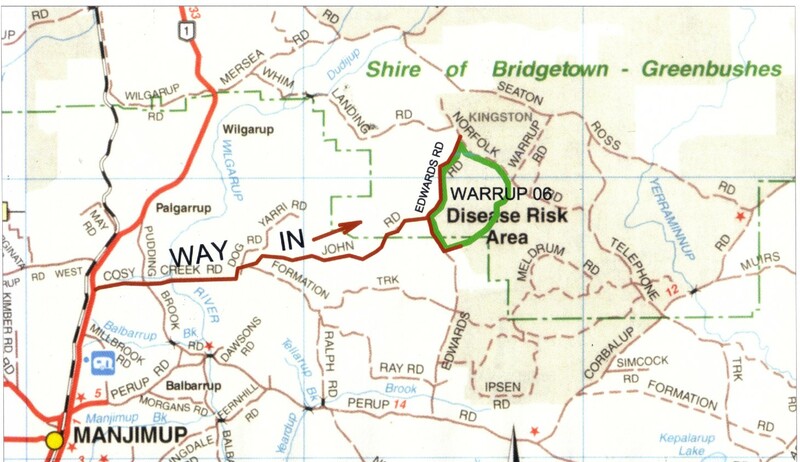 The 5840 ha block is in the Greater Kingston forest region, some 30 kilometres south-east of Bridgetown Intensive logging is scheduled to begin before winter in the Warrup 06 compartment. Logging will then follow in Warrup 08 compartment, east of compartment 06. When the Greater Kingston National Park was being set up in 2004, part of the Warrup forest block was left out of the Park despite the strongest representations by Bridgetown conservation groups. This was because CALM wanted access to the large volumes of high quality timber in this block. Much of the Warrup 06 compartment is only minimally disturbed, being selection logged once only for prime jarrah in the 1940s, and thus has high conservation value (HCV). The forest throughout Warrup block is ecologically mature with old growth characteristics. There are many tall, old jarrah and marri trees with varying sized hollows that are needed by tree-dwelling fauna such as the red-tailed black cockatoo and the ringtail possum. Unlike regrowth areas this forest has diverse and mature midstorey vegetation with dense thickets that provide high quality habitat for foraging, and refuges for nesting and breeding of many mammal and bird species. These species include uncommon, rare and threatened mammals such as the woylie that are now greatly restricted in their range in the south-west but still have populations in the Greater Kingston forest region. The river, stream and wetland ecosystems that occur in the undisturbed mature Warrup forest provide important habitat for many animals. Moist zones in these low rainfall forests also contain micro habitats used by rare and little known moisture dependent Gondwanan invertebrates and many other microorganisms that contribute significantly to the health of forest ecosystems. Warrups special values are not represented in the reserve system. As well as important natural values, the Warrup forest also has significant historical and cultural values. Warrup block and its adjacent forests contain 17 artefact sites listed on the Aboriginal Sites Register. These show traditional occupation of these forests by the Kaniyang people.These forests also have associations with Aboriginal and European pastoral endeavour in the south-west in the 1880s and early European settlement in the region in the early 1900s. The forest in Warrup 06 compartment contains a surviving three kilometre section of bush railway formation with a variety of cultural features that illustrate the final phase of bush rail operations of Millars timber company in the 1940/1950s. Besides greatly increasing the risk of salinity and dieback, extensive disturbance from roading and intensive logging will seriously damage and disrupt the long-term biodiversity and environmental integrity of these valuable forests, especially their fauna habitat values. Surviving and potential unassessed cultural heritage sites and their context may also be damaged or lost. Given the uncertainties and threats from climate change to future forest condition and health, Warrup forest must be left intact and undisturbed for its significant natural and cultural values and potential carbon storage role. It must be protected from logging with its unwanted and unnatural legacy: a diminished forest, depleted biodiversity and cultural heritage and destructive, unnecessary waste of irreplaceable nature.